Bored of organised challenges? 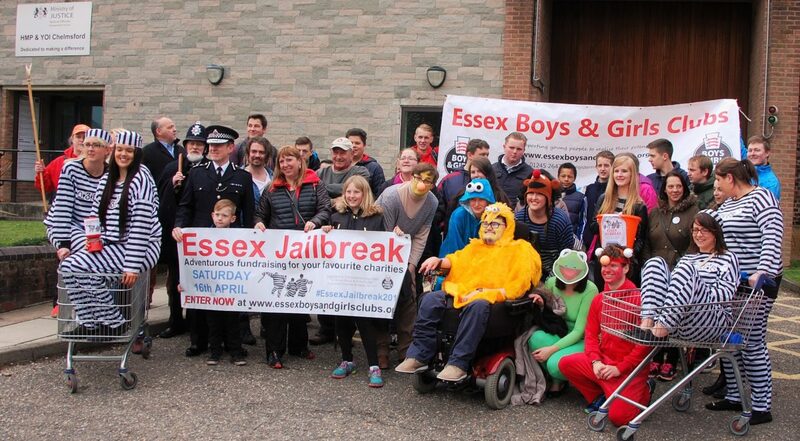 The Essex Jailbreak is different. Keep it simple or make it really complicated… dress up or dress down… plan ahead or wing it on the day… all you have to do it get as far as you can in 15 hours! You might have planned a route and roped in helpers and freebies along the way. You might not know exactly where you’re going but you might have a getaway car standing by. You might hop on a bicycle and use it as a training session. You might walk away in fancy dress with a fundraising bucket. The decision is 100% down to you. Essex Boys and Girls Clubs and another charity of your choice. Saturday 27th April 2019, 8am until midnight. Anyone and everyone! It’s a great opportunity for clubs, friends, businesses and teams to have fun. It’s a challenge – how far can YOU go? And how much fun can you have along the way? To raise money for two good causes: Essex Boys & Girls Clubs AND the charity of the team’s choice. WHAT EXACTLY HAPPENS ON THE DAY? At 8am you arrive at the prison and register with EBGC and pose for some press photos. At 8.50am all the teams get locked inside the main gates of the prison before being let out at 9am to escape! From then on, it’s up to you! Plan ahead, beg, borrow and blag to give your team the advantage! The only rules are that you can’t spend any money on your escape, you must not break the law (obviously!) and there must be at least one person over 18 in the team. Our staff will be on hand in the office, keeping in touch with teams via Twitter, Facebook and phone and letting the press know how everyone is getting on. At midnight (or earlier) you must call in your final time and location to the EBGC team, with evidence (ie: photo, GPS link or signature from a local authority). In 38 years of running the Jailbreak we’ve seen all sorts of entries. The best tip is to plan ahead – the more you can arrange/blag in advance the better your chances. Free transport, food and accommodation, as well as support from the press and celebrities, can all help you get further. * Distances are judged as the crow flies and as per mileage given by The AA. HOW DO I DECIDE WHERE TO GO AND HOW? – make it about the journey – how far can you walk / cycle / run / pogo? You might be in fancy dress, carrying collection buckets or using it as a training exercise. – make it about the method of transport – from husky dog sleds to tanks to vintage cars to tandem bicycles to hospital beds on wheels, we’ve seen lots of clever and hilarious ideas. – make it attractive to sponsors – persuade a local business to lend you a vehicle and petrol money, or a travel company to give you free bus/train/ferry tickets or even flights! Remember, Stansted, Southend and City Airports are all nearby, plus don’t forget the local ports of Harwich and Tilbury and the rail and bus networks. – make it virtual – head to your gym or clubhouse for a virtual marathon on rowing machines, exercise bikes, running machines or circuit training. Get online and challenge overseas opponents. And remember, the more fun and interesting you make it the better the story and the more likely the press will be to print it – raising awareness of your club, cause or business! WHAT DO I DO ABOUT SPONSORSHIP? > To collect sponsorship ONLINE, please join our event on Virgin Money Giving here. > To collect sponsorship OFFLINE, please download and print the offline sponsorship collection sheet, which must be submitted with funds raised. > Half the sponsorship money raised is to be paid to EBGC, the other half to a charity of your choice. > Details of sponsorship to be finalised and payment of the EBGC share to be made by than 24th April 2017. WHAT DO YOU MEAN ‘WITHOUT SPENDING ANY MONEY’? Contestants can take their own money with them for refreshments and return travel only. Sponsorship money should not be used for expenses or travel. That’s completely up to you – please make sure you think about it before you set off! Please contact Natasha at NatashaW@essexboysandgirlsclubs.org to get a booking form sent to you and your team! Once all funds have been collected we arrange a Presentation Evening at a venue in Chelmsford. This will be held by the end of June 2019.